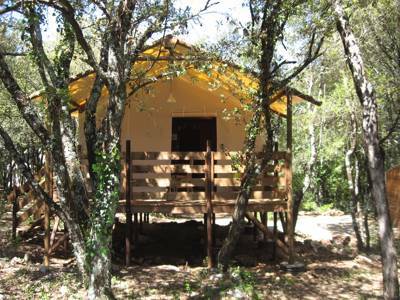 Welcome to your relaxing haven with large and shady pitches, where you can enjoy getting back to nature in this enchanting campsite nestled amongst the trees above the Ardeche. 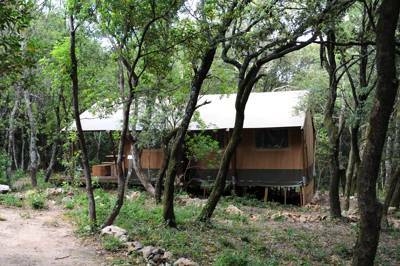 Situated on the edge of the forest, these Safari Tents are the biggest and most luxurious tents at Mille Etoiles. Large open plan living spaces open up onto your wooden terrace looking out through the trees. 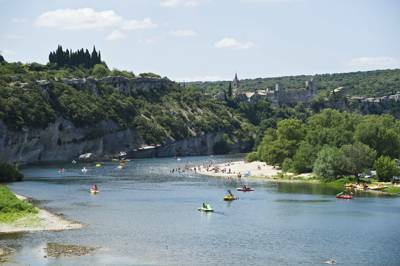 On a shady, wooded hillside overlooking the Ardèche River, Mille Étoiles is easily one of the most beautiful campsites in all of France. The forested land, sitting high above a canyon of sparkling, turquoise waters, is so fairy-tale-perfect, in fact, that weddings aplenty have taken place here. Experienced campers who celebrate the great outdoors get the most out of a stay at Mille Étoiles. The surroundings are a treasure trove of footpaths and trails, while the wooded setting gives a slight wilderness feel, despite the fact that every little comfort is catered for – from lanterns at night to posh toiletries in the wash-rooms. Those seeking extra luxury, though, are just as welcome, nesting themselves in the growing glamping side of the campsite. Mille Étoiles test-drove a few yurts in 2003, with no electricity or water, way before glamping in Francetook off, and cite nature as their star attraction. 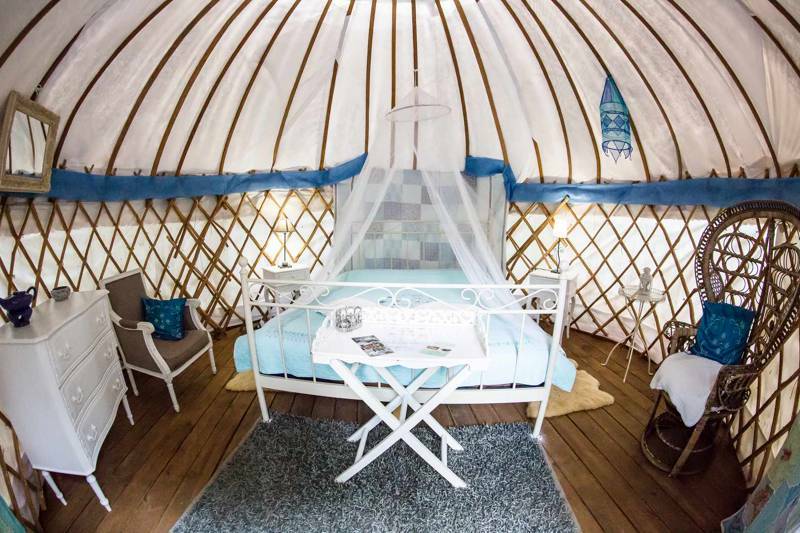 One look at these nomadic Mongolian yurts and fancy family bathrooms, though, suggests that there’s a lot more to the campsite than the enchanting surroundings. Raised on pine platforms, the yurts (now 'electrified') are each scattered a decent distance apart, with sumptuous double beds inside draped with large mosquito nets. Each one is themed (for example boudoir, Edwardian safari, Indian, Thai) and furnished with chunky wooden chests or canvas wardrobes, ethnic pictures, and recycled bedside tables. Starched, comfortable hammocks swing outside, while, within, a practical kitchenette has a fridge, stove and coffee machine, where you can make your hammock-ready brew. There are a further two safari lodges, divided inside into rooms, including a well equipped kitchen and dining area, and providing the most space for large families. ‘The Village’, meanwhile, is a tent-only camping field, that has been recently development to encourage more campers. Situated on the other side of the handcrafted pizzeria and café, the field is near a facilities block and all guests share the kids’ playground and campsite library. If wildlife is the only luxury you need, bag one of the camping pitches there or in the woods. 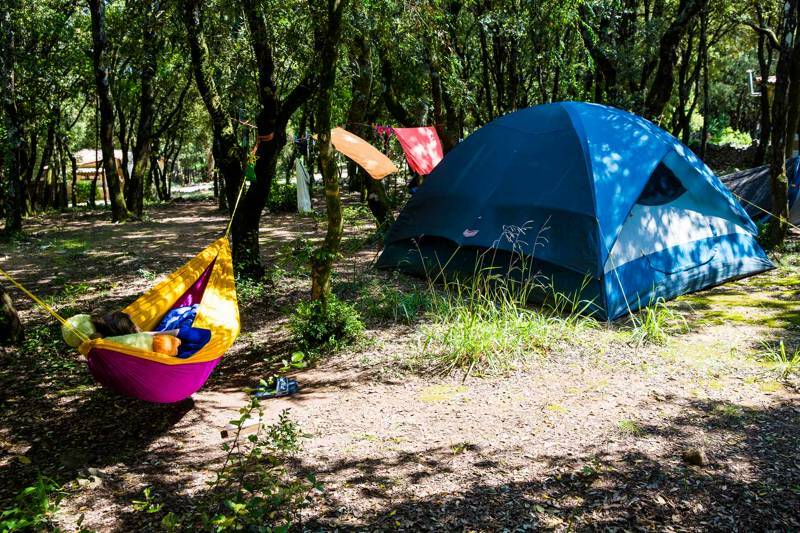 On a shady, wooded hillside overlooking the Ardèche River, Mille Étoiles is easily one of the most beautiful campsites in all of France. The forested land, sitting high above a canyon of sparkling, turquoise waters, is so fairy-tale-perfect, and the luxury yurts are pure heaven, making for a truly enchanting experience! For latest availability and best prices for Mille Etoiles, please use the Date Search above. 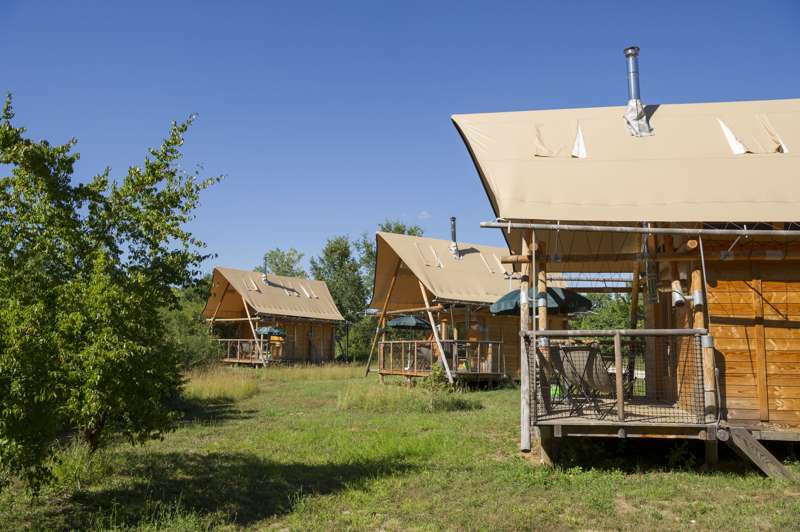 33 camping pitches, 11 yurts, 2 safari lodges and 2 tents on stilts. A giant communal yurt in the middle of the woods is available for group hire or for general use (yoga routines, story-telling, hide-and-seek). 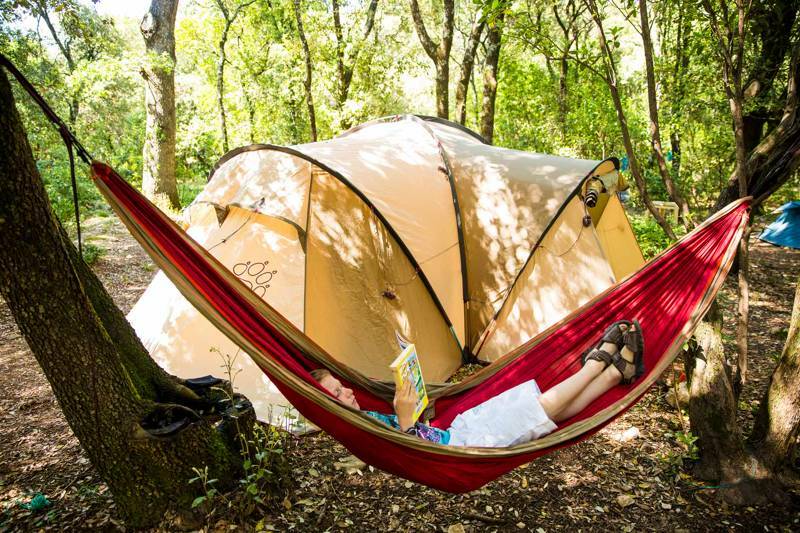 Tent pitches in the woods and in a field with water points, a few electric hook-ups, picnic tables, and hammocks. The self-catering yurts comfortably fit a family of 4. The safari lodges sleep 7 with ample space and have fully equipped kitchens an en suite bathroom facilities. 2 shower blocks, one by the yurts with 6 family bathrooms (sink, shower) and a block with 4 shower cubicles and 5 loos, plus laundry. Bath towel hire €4 each. There's a small grocery shop and a library. The bar, pizzeria and pancake house (see food & drink) opens mornings and evenings selling local wines, beers, fresh juices, water, ice creams, pizzas and Ardéchoises specialities. There's a playground and you can rent mountain-bikes by the day, half-day or for several days. Canoe on the Ardèche or Cèze. Hire boats and instructors from canoyak.fr to take a 2-hour or 2-day excursion. Park at Sauze and a shuttle bus runs to Vallon Pont d’Arc, so you can pick up your vehicle at the end of the day. Join the throngs at the iconic sandy beach of Vallon Pont d’Arc, or view it from the road above. This stone ‘bridge’ is one of France’s best-known landmarks and epitimises all that is great about the country (throwing off your clothes for a swim in a river sounds appealing to us). Barjac is a short drive away – worth a visit on Friday mornings for market day. A recent addition to the campsite is an excellent little restaurant with reasonable prices and hefty portions food. There is a varied menu (including local specialities) and the mussels (with fries) are a particular highlight. There is a small farm shop near the campsite; ask for directions. Tent campers €15–€21 a night for 2 people. Extra person €4, child 3–12 years €2, and under-3s free. 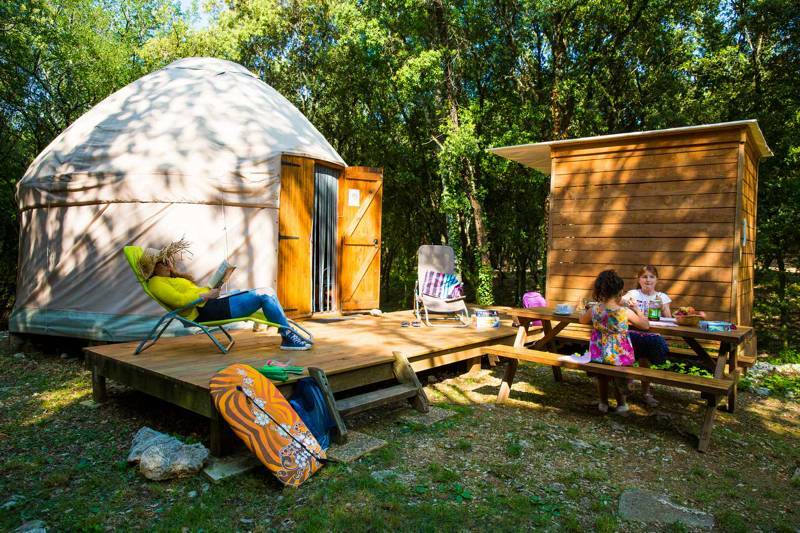 Self-catering yurts from €60 for 2 people, minimum 2 nights’ stay and in high season weekly bookings €490 for 2 people. Bed linen €10 per bed. From Nîmes airport follow A54 to Nîmes, turning on to A9 to Avignon/Lyon. Follow signs for Bollène/Montélimar, take exit 19 at Bollène and follow D994, D6086, and D901. Then turn right on D979 into Barjac. Follow signs to Labastide, look for a sign on the left to Les Crottes, then Mille Étoiles signs direct you in. Avignon or Montélimar are the nearest TGV stations, from where buses run to either Barjac or Vallon Pont d’Arc, then take a taxi. Nîmes, Avignon, and Lyon are the nearest airports, 90 minutes away. 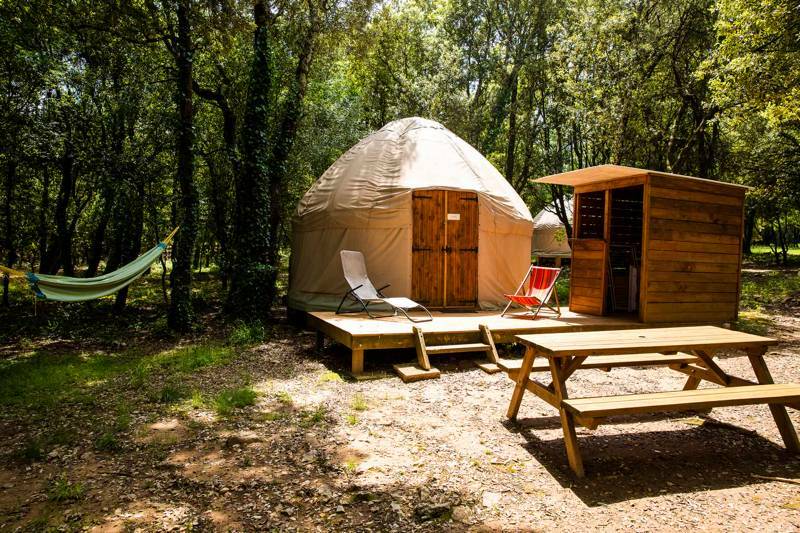 Camping and glamping among the forest of the southern Ardèche region in South East France.